Fast, easy, they give a better set than blow drying with a brush. Use them alone in a wet to dry set or use them towards the end of blow drying for extra staying power to your finished style. 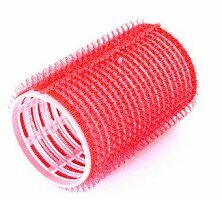 Ideal for experimenting and playing around with your hairstyle at home, this set of 6 Velcro hair rollers will help you create wonderful waves and carefree curls, without a trip to the salon. Want beach babe curls without having an expensive perm? No problem - bag some Velcro rollers and follow our step-by-step guide to curls. 1. Mid-length hair requires around ten small rollers - use more if your hair''s longer. Start by separating your hair into inch-wide sections. Then, work from the front of your head backwards, spritz each section with a setting spray. 2. Pull the hair section taut and slide the roller underneath. Then roll the hair over and around it till it reaches your scalp. The Velcro makes the roller stick by themselves, but you can give them extra grip with a hair pin. 3. Once all your hair is in rollers, give each section a quick 30 second blast with your hairdryer on high heat. This helps your curls stay in lots longer. But, for extra long-lasting curls, leave the rollers in a while. 4. After about 30 minutes, unravel your curls by using a large-toothed comb and you have finished!